Campsite Hautes Coutures - Réserver en ligne sur capfun.com! Only 5 km from the D-Day landing beaches. Camping Hautes Coutures is situated on the Côte de Nacre and is the ideal base for exploring seaside towns, beautiful views and tasty gastronomy. The campsite offers comfortable mobile homes, furnished tents and camping pitches. In the water park, consisting of an outdoor pool, a paddling pool, an indoor pool, jacuzzi and water slides, you will feel completely relaxed. Les Hautes Coutures is located in Bénouville in Normandy, between Caen and Ouistreham. The campsite is located next to a canal and 5 km from the sea, right in the middle of the area of ​​the landing beaches. The invasion beaches are ideal for hikes in beautiful scenery with a rich history. In Calvados you can try many water sports such as canoeing and sailing, but also more unusual sports such as longe-côte (water hiking) and stand-up paddle. Fans of more extreme sports can go bungee jumping from the Viaduct of Souleuvre or discover acrobatic trails in the forest. Finally, you can taste typical Norman products like Livarot, the oldest cheese of the region, and the sweet caramels of Isigny. You wish to arrive : Saturday Sunday No more availability? Try Sunday! No more availability? Try Sunday! People have different expectations when it comes to their holidays. Some prefer quiet holidays, being with family and tranquility. Others prefer sports and partying. With the Fun Dose you can choose the right campsite for the whole family. There are 4 different entertainment levels: green, blue, purple and red. The fuller the bottle, the more entertainment there is! If the bottle is green, or only half full, then there is little animation on the site. If the bottle is red, or nearly full, there is plenty of entertainment on the site. No matter the level of the Fun Dose, the mini-clubs and participation in all animation is free! On this campsite the Fun Dose is purple. This means it's a very lively campsite. 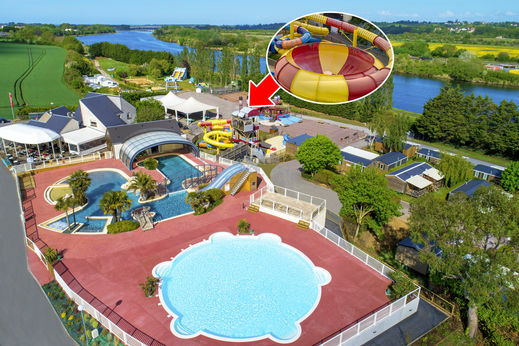 The Clapou Club (4-7 years old) and Policator Club (8-12 years old) welcome children from Monday until Friday, from 10am until 12pm and from 3pm until 5.30pm. The Nobodys (13-17 years old) meet up five times a week. Three animators are on site. Every morning you can enjoy aquagym and during the day sports tournaments and other events will be organized. We will surprise you with an extended evening program, four days a week! The various groups and artists that are invited will offer you shows of high quality. 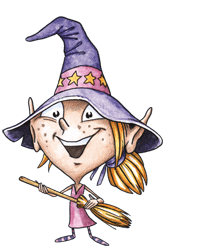 Do you know our little Carabouille fairy ? She is the one who builds incredible playgrounds for your children. 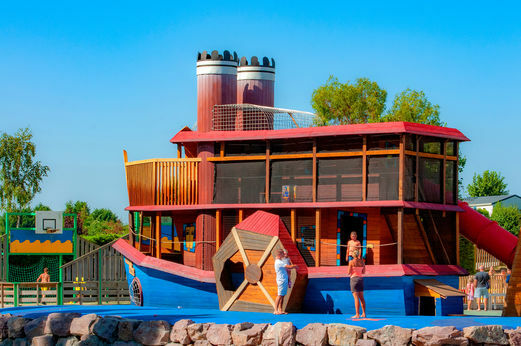 Those playgrounds are unique and only exist on the Capfun campsites! Your children are going to LOVE IT ! Opening hours of the waterpark : 9:00 - 19:00. Swimming shorts are prohibited (boxers or briefs allowed). Toddlers must wear diapers specially designed for swimming. The bracelet must be worn. For children who cannot swim it is mandatory to wear inflatable armbands. It is mandatory for children who cannot swim to wear inflatable armbands. Pets are allowed, (extra fee of 35€ / pet / week), leashed and vaccinated. Dogs of 1st and 2nd category are forbidden. 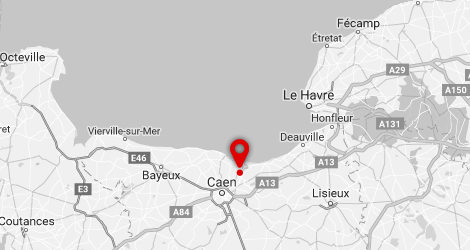 D-Day Landing Beaches : 5km - Pegasus Bridge and Memorial Museum : 1km - Caen Memorial Museum : 14km - Caste of Bénouville : 2km - Festyland amusement park : 20km - castle and abbeys of Caen : 12km - beach resort of Ouistreham / Côte de Nacre : 5km - zoos of Cerza, Champrepus and Jurques : 50/100km - Cabourg and the Côte Fleurie (Deauville, Trouville, Honfleur) : 17/50km - the cider route. Camping idéal pour les enfants!!! 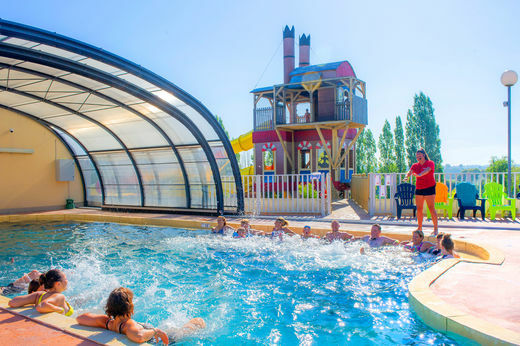 Surtout pour les familles avec enfants, le camping est propre mais les mobils homes trop proches les un des autres et aussi les douches sont souvent froide. mais dans l'ensemble c'est bien. Comme je l'ai dit, les douches, la puissance est faible, donc les douches très froide. c'est pas agréable. Très bien situé. pour ce qui aime faire de vélo. Télé dans tous les mobiles hommes. Campsite Hautes Coutures from up above!